Follow me, For Nothing Is Hidden From My Sight! and this is something im VERY excited about. 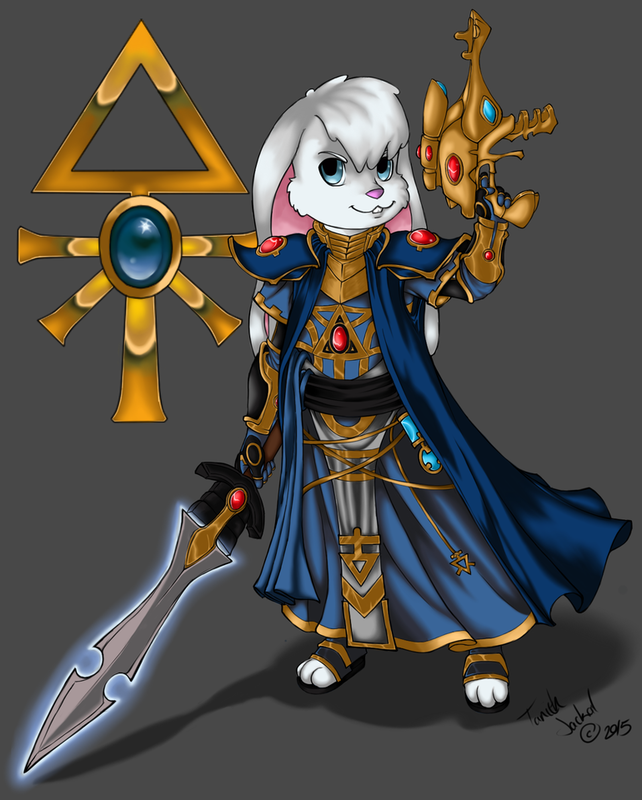 here we Have Kevin as an Eldar Farseer in some weird alternate universe where Eldar are rabbits. the stuff they have done to the 40k lore lately is atrocious but I still love the Eldar. im extremely happy with this, I was super picky about everything from the colors to the heraldry since it's all important and wile my favorite craft world is Ulthwe, this color scheme works better for Kevin. whom I feel deserves more then just a little credit for the work here. This artist was EXTREMELY professional with me and far more accommodating then they needed to be, I am blown away by there service and attitude and I HIGHLY encourage you guys to consider supporting this artist via commissions, they are extremely reasonably priced and a joy to work with. but your guns a lot more fun. Looks really cool but I think those tiny crystal disc not really do much harm to a power armour only you find the right spots where the armour parts a put together. The Orks have a lot of respect for the shuriken catapult. Its the only weapon they know of that is both shooty and choppy. heh Looks great! Have to look into that. Bah, silly space Frenchies. Chaos is the only true answer. It's good that you got an excellent piece done, by a professional artist that works with their customer to create such good work. I knew there was a reason I followed you! What they did to fantasy (age of sigmar) was wayyy worse.... BLOOD FOR THE BLOOD GOD!!!!! and MILK FOR THE KHORNE FLAKES! I knew there was a reason I followed you! What they did to fantasy (age of sigmar) was wayyy worse..
Beautiful work - Now if only my GW2 Ranger looked as good. See..this is the kind of thing that just puts my creative juices into flood mood and my imagination into over drive! Wish there were more furry warhammer fans local to me ! :) Very nice, i love how well the outfit came out !